We are happy to report the start of bedroom renovations at Chanters Lodge. Rooms 9 and 10 were built and opened in 2006 overlooking the then new swimming pool and these rooms have really really worked! Wear and tear takes its toll! The picture shows Benson Bulongo the tiling expert busy destroying the work he did in Room 9 all those years ago, in preparation for laying new floor tiles in the bedroom as well as new floor and wall tiles in the bathroom. Emma from Emma’s Wear in Livingstone is busy measuring for new curtains, as well as a bed cover. Looking For Mrs Livingstone – And Chanters Lodge! We were delighted to get a recommendation for Chanters Lodge right at the end of this piece from The Herald Scotland which I have shortened a little. 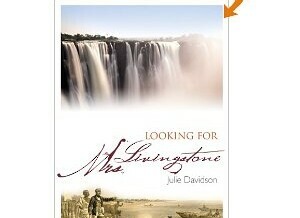 The writer is Julie Davidson and the picture shows the front cover of her new book. They don’t do zebra crossings in Livingstone, they do elephant crossings. You need to know where and when to look, as there are no road markings giving the great beasts right of way, but the local taxi drivers will take you to the junction of their favourite route. Each day, a mile or two from the new Shoprite mall, just after sunrise and just before sunset, the elephants cross the town’s main drag: Mosi-oa-Tunya Road, which is not only its lively commercial hub but the road to the Victoria Falls. For all its elite lodges and luxury hotels, Livingstone remains wild at heart. How did the tribal lands of the Toka-Leya and the old colonial settlement of a British land-grab become a celebrated tourist hub and the “adrenalin capital of Africa?” It’s all down to a phenomenal geological fault and the marketing skills of a famous Scot, with a bit of unsolicited help from Robert Mugabe. Until the late 1990s, the town of Victoria Falls on the Zimbabwean side of David Livingstone’s self-proclaimed “discovery” was the honey pot for visitors. It is much closer to the eponymous cataract (Livingstone is seven miles from the river on a rising hill) and its tourist industry was better organised. But since my own early visits to both I have seen the Zambian town become the beneficiary of Zimbabwe’s political instability, and expand and prosper without losing any of its charm. In fact, its new affluence has saved many of its historic buildings, including the Edwardian clubhouse of Livingstone Golf Club, which re-opened in 2006. I was back in Livingstone for the bicentenary programme’s academic conference: “Imperial Obsessions: David Livingstone, Africa and world history: a life and legacy reconsidered”. The boy from Blantyre doesn’t only live on in Zambia, he has a global afterlife that is apparently eternal. For three days, European, American and African scholars chewed over papers that ranged in theme from “Livingstone’s dialogue with the rainmaker and the legacy of the Scottish Enlightenment” through “The empire of sentiment: David Livingstone’s 1874 funeral and Africa at the heart of the nation” to “David Livingstone: Prophet or Patron Saint of Empire in Africa?” Not all the speakers were academics; I was there on the back of my book, Looking for Mrs Livingstone, to remind the scholars that the great man had a wife whose contribution to his early journeys is often overlooked. Closeted in a hotel conference room for three days while the sun shone on the glittering plumes of the Victoria Falls, I was expecting a certain amount of frustration, if not tedium. But by and large it was all stimulating stuff, and when we were released into the brilliant light and sumptuous greenery of the Livingstone suburbs I felt I needed none of the manic attractions of the town’s adventure tourism – bungee jumping, gorge swinging, riverboarding, abseiling, white water rafting, flipping over the falls on a microlight – to improve my mood. Only the falls could do that. I’ve never felt they needed any of the extreme sporting accessories they have acquired to intensify the exhilaration of their spectacle. I have flown over them in a helicopter and swum in the Devil’s Pool on their very lip, looking into the abyss as it gulps down epic draughts of the Zambezi. (This is something you can do, at a price, from Livingstone Island, but only when the river level drops in the dry season, usually between August and January). But I’ve had my best moments simply walking along the rim of the gorge beside the five mighty cataracts, my insides trembling with their Plutonian thunderclap, daft tears of emotion mingling with gusting douches of rainbow spray. Different seasons bring different volumes of water over the Falls, but there is no such thing as a wrong time to see them. When the Zambezi is in full flood you get towering columns of spray and boiling cataracts; as the dry season progresses the spray dwindles, the curtain of water parts between the main cataracts to expose the 300ft cliffs, and you get some sense of the geological force which, millennia ago, tore a rift a mile-and-a-half wide in the flat Zambezi valley; and in every season the forest walks on either side take you through storybook Africa, alive with monkeys, baboons and exotic birds. So once again, with three of my fellow conferees, I negotiated a $10 dollar taxi ride down Mosi-oa-Tunya Road to the Victoria Falls National Park, paid the $20 entrance fee for foreign nationals, saluted the statute of Livingstone, stern and questing, just inside the gate, and set off along the forest path to the incomparable viewpoints. Sure feet were needed on the rough stone steps and slippery earth; the Falls were full and it was the first time I’d crossed Knife-Edge Bridge in spray so dense the figures ahead of me slipped in and out of view. Then a wonderful thing happened. This scary footbridge, maybe 200ft high and 100ft long, is a link across a vast bowl of emerald bush on the edge of the cauldron. As I slithered along, holding tight to the handrails, the spray was cleared by a persistent eddy of wind, the sun flooded the steep slopes of the bowl and a rainbow arched over the forest. As I paused to look, a lone swallow pierced the spectrum, darting in and out, swooping and soaring until it had climbed over the rainbow. There are no direct flights from Europe into Livingstone but it is easily reached from South Africa and, as of this month, from Kenya, with connecting flights from the UK. British Airways (ba.com) and South African airways (flysaa.com) have daily flights via Johannesburg, while Kenya Airways (kenya-airways.com) has opened a new route three times weekly via Nairobi. Where to stay Livingstone and its environs cater for everyone from penny-pinching backpackers to well-heeled retirees. At the top end are exclusive, all-inclusive riverfront lodges like Tongabezi, the River Club and Stanley Safari Lodge, or the five-star Royal Livingstone Hotel, with its enviable site beside the Falls; in the middle is a range of three-star hotels and private guest houses; at the budget end are clean if boisterous hostels like Fawlty Towers and Jollyboys Backpackers. And then there is Chanter’s Lodge, which on my last visit became home for five days without stretching my wallet. Check it out: chanters-livingstone.com. Ridgeway Hotel – 60 And Still Going Strong! Southern Sun Ridgeway Hotel turns 60 years old this year – as one of the longest serving general managers in the hotel’s history I was asked to write a short piece for Lusaka Lowdown. Out of many memories this is what I mustered! “Well it’s happy 60th birthday to the ‘old lady’ of Lusaka hotels, Southern Sun Ridgeway Hotel, formerly Holiday Inn, formerly Ridgeway Hotel – like many rich old ladies she’s had plenty of face lifts over the years! My time as general manager of the hotel stretched from March 1979 to May 1992. The hotel faced intense competition in 1979 with the opening of the Taj Pamodzi Hotel across the road (initially managed by British Caledonian – remember them?) and The Ridgeway had to re-invent itself to survive the inevitable exodus of Guests to the new project next door. I was appointed just in time for last minute preparations for the famous 1979 Commonwealth Conference, the one that heralded independence for Zimbabwe, and just before the opening of the Pamodzi! Tough times! We managed to achieve our market share in the face of this competition by concentrating on our Zambian market, providing the best entertainment in the city with a succession of great bands, including the Cool Knights and the Lubumbashi Stars. Zambians love to dance and they flocked to the hotel. In the mid 80’s you had to book well in advance for a seat in Musuku Restaurant on Friday and Saturday nights with top Zambian cabaret stars like Akim Simukonda, Muriel Mwamba and Lazarous Tembo wowing their audiences, while Guests tucked into famous Ridgeway buffets – or, of course, ‘chicken-in-the-basket’. We were known for hosting great functions and many were memorable – the ‘stand out’ was, perhaps, the Show Society Annual Dinner of 1982 for 250 of Lusaka’s great and good, with KK and Prince Phillip in attendance. In the mid 80’s we also had a regular weekly radio show, a highly successful football team on the verge of a place in the Zambian super league and regular TV shows at Christmas and Easter. We put crocodiles back in the central area of the hotel when we redeveloped the restaurant on the other side of the pond, renaming it ‘Rancho’ and making it famous for great whole Zambezi Bream as well as for the chicken-in-the-basket and wonderful huge T Bone steaks. The beautiful weaver birds inhabiting the pond formed the logo for the hotel in those days, drawn for our letterheads and stationery by Gabriel Ellison. Initially I managed the hotel for Hallway Hotels but for most of the period of my management I worked directly for Anglo American the owners. John Phillips and Sharon van Reenen formed the rest of the management team and we were proudly responsible for training many Zambians in catering and hotel management with sponsorships and scholarships to both Kenya and UK. Interesting piece here from HotelInteractive about who’s travelling and why. Interesting too that they talk about the ‘booming’ hotel business in the US at the moment – can’t say it is in Livingstone but if things are picking up in the States, that can only be good for future prospects. Here’s the piece, slightly edited. The picture? What some of our Guests do when they come to Livingstone! We all know the hotel business is booming, but looking specifically at who that business is coming from isn’t something we’ve really dug in to. Until now. So who is that consumer knocking at your door? Turns out there are a healthy mix of leisure and business travelers that are combining to make this a very robust time. Toss in ever increasing group business – those folks booking 10 or more rooms at a time and we have a situation where all there major demand groups are doing what they need to do, demanding rooms. Recovering group business, however, is helping hotels push rates, even if a specific hotel does not focus on group business. As group demand becomes more solid they can get higher room rates for the remaining rooms to sell to transient guests. Plus those with more groups displace transients which sends them to other hotels so those hotels can push rates too. Lodging demand and lodging pricing remain headed in the right direction. A big chunk of that leisure business is coming from non-vacation trips, which have become more popular in recent years. Research points out that for personal leisure travel, 32 percent travel for special events such a soccer tournament, 28 percent are on the road visiting friends or relatives while 4 percent take trips for medical or health care reasons. Most interesting is that 10 percent are taking trips to events like personal improvement expos or conventions like ComicCon. People are also vacationing more in spring and fall, which has created a much longer and stronger travel season. Shoulder seasons are growing, it is no longer just summer. Even for vacations summer is still strong but many are pushing their trips into spring or fall. D.K. Shifflet & Associates research also points out that while Baby Boomers make up the vast majority of travelers now, the coming of travel age for the millennial generation combined with the passing away of the Silent Generation is quickly changing the typical age of people traveling. By 2020 Millennials, Gen X and Baby Boomers will each be traveling in roughly equal numbers. This means hoteliers will have to take several different approached to appealing to their target guests. It also means hotels will have to continually focus their properties on niche customers if they want to create strongly definable product, we believe. One concern for hoteliers is social media of course. Many prognosticators say it is hyper critical to dive in to this emerging communication medium. But is it as important as many believe? For Facebook less than 15 percent of online posts have anything to do with the hotel itself, which 50 percent post photos and 30 percent discuss travel experiences; which usually are more destination specific. But it’s also more generationally specific. Just over half of all millennial travelers are posting while that number drops to around 35 percent for Genn X and about 22 percent for Baby Boomers. As for Twitter, about 5 percent tweet on travel experience while about half that number tweet on hotels. He said 57 percent of business travelers use a mobile device to access the internet for travel information which is up from 40 percent in 2010. For leisure travelers 38 percent use a mobile device to access the internet for travel information, up from 11 percent in 2010. In 2012 we completed renovations of three of our eleven rooms at Chanters Lodge, Livingstone, one in the ‘main house’ which was the last of the three original rooms we opened in 1998 to be completely renovated. We then turned our attention to the four Lukulu Crescent rooms opened in 2004 and managed to completely renovate two of them, before being hit by a rather a bleak mid-November to mid-December business wise, that curtailed our activities. Following this unusually difficult period we had a reasonably good festive season. This morning we are happy to report that we have started renovation of the third of the four Lukulu Crescent rooms, and the picture above shows the workers starting to break the bedroom floor tiles. These will be replaced with a larger lighter, brighter ceramic floor tile. A new toilet and pedestal wash hand basin are to be fitted in the shower room and the floor and walls of the shower room will be completely retiled. New drainage arrangements, tap and towel rail fittings to match. We were happy with the results of our renovation in the first two Lukulu rooms and I’m sure room five will turn out just as well. It gets slightly easier as you go along, as the team are aware of the requirements from the previous work. We will keep you posted!